This course is offered in a group or privately. The group sessions are scheduled classes, booked either once per week (for 5 weeks) or over a weekend. There are 5 in-class and pool modules. 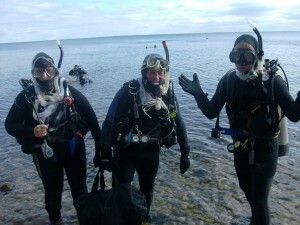 Once these have been successfully completed, you can arrange the 4 open water training dives. 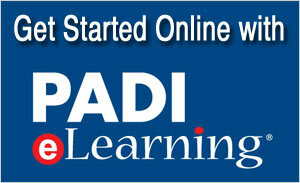 It is the 4 open water training dives that qualify you to become certified. They can be completed within our normal diving season, or you can opt to complete them down south in warm water. We will provide the documents needed for this option. Please give us a call or refer to the calendar for our courses dates and options. The cost of the course, based on our group rate, includes the Instructor for all 3 aspects of the program (classroom theory, pool skills and the 4 training dives, all within a group scenario). It also includes your course materials, manual and scuba equipment while you are in training at our pool facility. 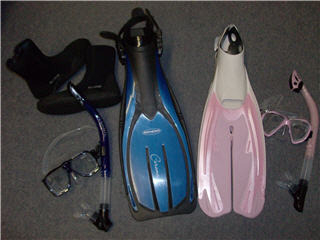 The course does not include your personal gear kit – mask, snorkel, boots and fins. We sell this as a package and will take the time to custom fit you, a few days before your course begins. Because this kit is yours, it is important that it fit properly. The rental gear needed for your 4 open water training dives, is also extra. It is not due until your training dives are scheduled. We can give you a couple of different options to complete your training dives, to stay within our group rate, either locally or a weekend trip to Tobermory. Any private training will be subject to additional fees. There is a medical questionnaire that you must read, complete and sign before you can participate in scuba diving activities. If you indicate “yes” to any of the conditions on the medical, it does not necessarily mean you cannot participate on SCUBA, but you must first obtain and provide clearance from your physician. There are no exceptions to keeping safety a priority. What type of emails would you like to receive? Services/Products Courses Dive Trips All of the Above!